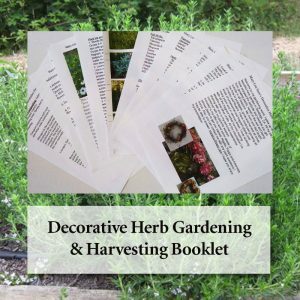 My 2018 herb growing booklet, is filled with a ton of simple and useful ideas for a successful herb garden. I have made it simple to do and low cost. You will receive color pages, with pictures of many of my recommended herbs and their growing requirements. A sheet about propagating more plants, and a few compost methods. It's simple to grow herbs and the harvest is such a joy. You can dry and craft with all kinds of these fragrant and colorful plants. I will be sending the documents through your mailing address for now. Some of the favorite herbs I've included are: Statice, strawflowers, culinary oreganos, winter savory, oriental poppies, grosso lavender, Kent Beauty ornamental oregano and nigella. Also included are, Artemesia Annua, Catnip, Monarda bee balm, Larkspur, Ammobium, Globe amaranth and White sage. You can view some decorative herbs in the slideshow below.